Here at Overdose.am we aim to guide you to through the cultural life in Amsterdam. That means we always keep an eye out for talented musicians, our Mixtape Monday series is the prime example of that. But we’re not the only ones. We all know Converse from their awesome and comfy sneakers, but did you know the company is more than active in the music field? Well, now do you. And they’re looking for you! Interested? Just keep reading. So, what’s the deal here? Converse just announced they’ll be back with their Rubber Tracks pop-up studio. Up-and-coming musicians (that’s you) can apply to record for free in state-of-the-art facilities! Applications will kick off from today until September 16th, and Converse will be offering free studio time to ten lucky local acts. “Creative people have made the brand who we are today,” said VP Geoff Cottrill once. Rubber Tracks is a way for the company to emphasize that, and they’re doing a pretty good job. Converse celebrates creativity and this is their way to say ‘thank you’ to the creative community that has embraced the brand throughout its history. It provides a platform for upcoming artists to unleash their own creative spirit, and thus completes the circle. Converse Rubber Tracks gets its name from the original flagship studio in Brooklyn. 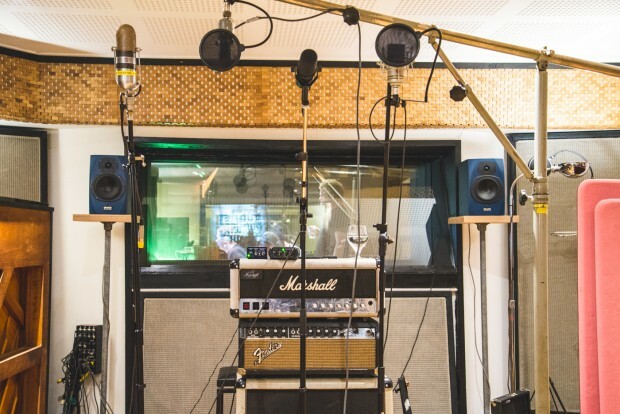 Since the opening in 2011, almost 1000 emerging artists have had the opportunity to record original music alongside the Converse Rubber Tracks team of expert technicians for free. The program has evolved over the past three years with pop-up studios all over the world. Amsterdam was Europe’s first, back in 2013. And now they’re back for their third pop-up in the Dam. This edition will be leading up to ADE, the worlds biggest electronic music conference and festival that’s annually being held in October. In collaboration with long-time local partner and studio curator Red Light Radio the festival will also host Converse Rubber Tracks Live. This will be an energetic live music showcase where an international producer will perform, supported by the selected artists. All the more reason to apply, it’s not often you get the chance to perform at an event like that! Fancy a full day recording session under professional guidance at the Amsterdam Recording Company? The pop-up studio will open its doors from October 7 until October 16. Deadline for submissions is midday 12:00 on September 16. Apply here on Converse-music.com. Good luck!